I am finally getting out of the disk rut I have been stuck in for a while, by practicing my stringer work on some curved surfaced beads. I’m enjoying building up the layers of colour on them, but they are pretty big, so take a while to do. In other news, I have some silver cored rings in the kiln, haven’t done any of them for ages! I’ll let you know how they turn out! Also in the kiln is a massive 5mm holed bead collection for a lovely lady in Moscow. It was a pretty big order (60 beads!!) so it will take a few days to complete. Hopefully I can get a nice photo of them before they head to Russia! You will be linked to my etsy shop if you click on the pictures. Oh, and I’m going to the DJCAD Degree show today! I can’t believe its been a year since it was our show!! I will be back to report later! Striking it lucky…Getting the hang of Raku. Actually, I hope not, I think there was some skill over luck with making these! ‘Raku’ is a glass made by Reichenbach, under the name ‘Iris Orange’. It got nicknamed Raku in reference to ceramics I believe, though I don’t know too much about that (I should probably look it up). Anyway, this glass, and its sister glass colours by Reichenbach (Magic, Multicolour) are what was used to make this set, along with a bit of Gaffer’s Chalcedony. 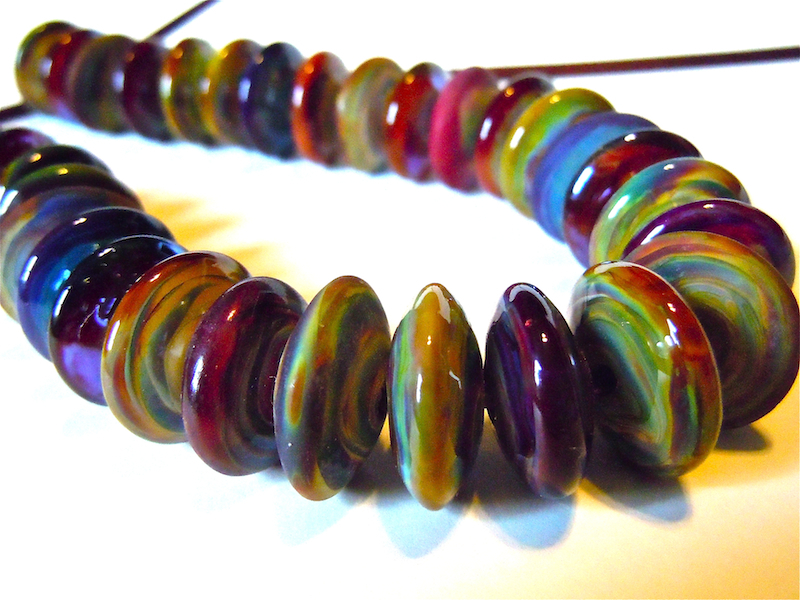 Each bead is made from a rod of one colour. 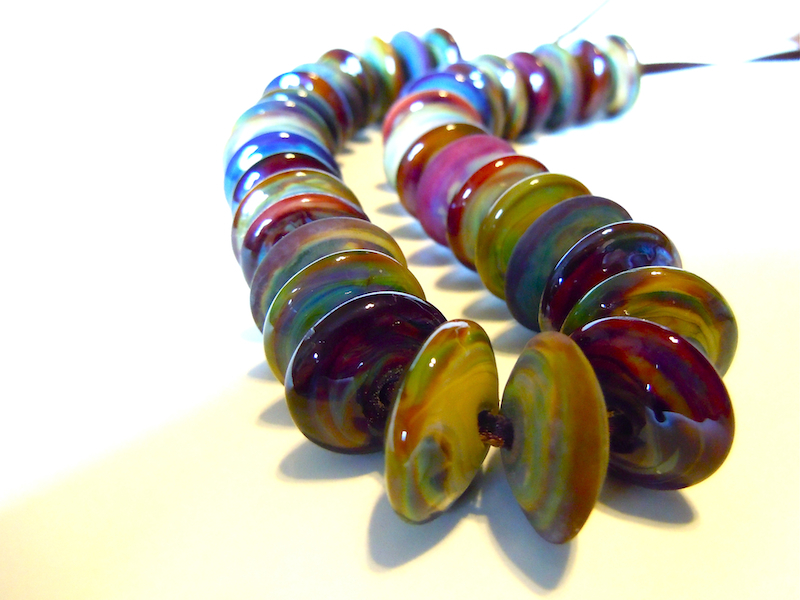 Most of the rods start off as a sort of muddy brown, but by playing with different temperatures and temperature changes, you can get crystals of various colours to grow, making the finished bead show lots of different colours spreading through it. I’m about to go and swot up on the striking cycle so I can understand the chemistry of the process a bit better, but I am really happy with what I achieved with these colours, it has taken a lot of practice!